This week, the US patent office issued 6,798 patents. Each patent adds a little something new to the human knowledge base. As we can’t list all six thousand, the PatentYogi team has selected the five most interesting patents. Engines on commercial passenger jets are sized for take-off conditions. This design condition leads to engine sizes that are larger than necessary for every other phase of the aircraft flight. The larger sized engine for take-off conditions results in higher purchase costs, higher cost of operation, creating additional drag to the aircraft, adding fuel consumption, and affecting range of the aircraft. Further, take-off and climb-out noise from commercial aircraft engines is a contributor to noise pollution near airports. With respect to landing, commercial aircraft utilizes thrust reversers to decelerate the aircraft. Use of thrust reversers consumes fuel and contributes to noise pollution near the airport. The system invented by Boeing includes a platform for supporting the aircraft. A clamp mechanism on the platform releasably couples the aircraft onto the platform. Further, a conveying system is coupled to the platform and configured to move the platform to accelerate or decelerate the aircraft coupled to the platform. Therefore, a smaller engine can be installed to the aircraft itself, which saves fuel, improves efficiency and range, and reduces noise pollution considerably. Google is continuously improving Google Glass. The overall design of the device is largely similar to spectacles that people wear to correct vision related problems. 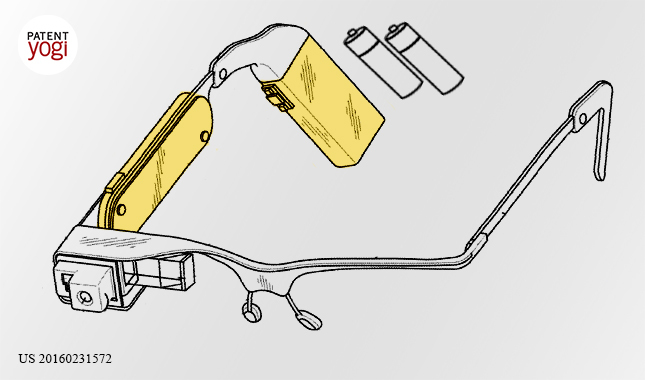 The patent reveals that Google Glass will include a big touchpad on one of the arms of the device. The touchpad is installed on a touchpad housing that contains electronic circuitry and a power source. Further, the device includes a big earpiece housing positioned behind or over the ear of the user while being worn. Earpiece housing contacts a portion of the user’s head to help secure the position of device. The two housings (touchpad housing and earpiece housing) include memory, a microprocessor, communications devices, such as cellular, short-range wireless (e.g. Bluetooth), or Wi-Fi circuitry for connection to a remote device. Further, the earpiece housing includes a battery or multiple batteries of various forms, such as AAA, AA, or 9-volt style batteries. These batteries can be quickly replaced and recharged separately. However, the battery can also be a rechargeable battery such as a lithium-ion or nickel-cadmium battery. Moreover, the earpiece housing is positioned to provide a balancing weight to that of touchpad housing or display positioned forward of the user’s ear, which causes a portion of their weight to be carried by the user’s nose. By adding weight behind the user’s ear in the form of earpiece housing, the ear becomes a fulcrum about which the weight of the display and touchpad housing are balanced against that of the earpiece housing. This relieves some of the weight on the user’s nose, giving a more comfortable fit. Therefore, a majority of the weight is carried by the ear of the user, but some weight can still be carried by the nose in order to give the device a secure feel and to keep the bridge anchored on the nose. Climate models generate data that are of great value to society. Climate model outputs include retrospective analyses that model the historical state of the climate, estimates of current climate conditions, and projections of future climate conditions. Offering climate data analytics as a service makes it easier to access climate model data and perform data analyses where the data are stored. The capabilities of a climate data analytics service can be made available to client devices through an application programming interface. Currently, however, the ability of end users, applications, climate researchers, or members of the public to gain meaningful access to climate data analytic services is limited. The current technologies are deficient because there exists no effective means for gaining access to the libraries, utilities, and documentation that include an application programming interface. There is a need to provide easier access to the capabilities of a climate data analytic services application programming interface. NASA has patented a system to deliver a climate data analytic services application programming interface to the end users. The climate data analytic services (CDS) application programming interface (API) distribution package provides a system through which users can acquire the tools necessary to install and use the CDS API on a client device. The system includes a command-line interface that provides a means of interacting with a climate data analytic service by issuing commands directly to the system’s server interface. The system also includes test utilities that evaluate the robustness and performance of an installed client-side application programming interface environment, and build utilities that install the application programming interface library and create the client-side run-time environment required by the library. NASA’s Climate Data Services (CDS) provides tools and services to visualize, analyze, compare, and publish climate model data, specifically data generated at the NASA Center for Climate Simulation (NCCS). CDS is further addressing the problem of searching, analyzing, and visualizing big data. It aims to give diverse users intuitive interfaces to a complete collection of NASA model data sets. By broadening access to model data, NASA envisions advances in scientific research as well as new applications benefiting society. Researchers, news organization and public in general may use this service to research and find solutions to problems like Global Warming. Telepresence systems allow users located remotely to interact with each other – making them feel as if they are present, at the same location as that of the other user. Current telepresence solutions, such as commercial video teleconferencing systems, provide multiple users with the ability to interface electronically, using both audio and video feeds. However, this typically involves each of the users being present in an established teleconferencing facility at a fixed location. One solution is use to telepresence robot that may be navigated by a remote user, for example, through corridors, into and out of offices, conference rooms and other work spaces, and the like. Ed Snowden used such a robot to deliver a TED talk in US while in exile in Russia. However, the size and energy consumption levels of this type of telepresence robot hinder its ability to effectively navigate complicated spaces with limited open floor space for the robot to traverse. Additionally, this type of telepresence robot cannot traverse stairs, and would require on-site human intervention to access a work space on a different floor using an elevator. Google has invented a system that includes a drone carrying a screen. The images of the remote user are projected on the screen. The remote user can navigate and control the drone which allows the remote user to be fully engaged with participants in the designated location, and to move from one designated location to another. The screen orientation is maintained, as the drone flies around. When not in use, the screen can be folded into a position along the base of the drone. Further, the screen may be replaced with a tablet computer. Alternatively, a smartphone installed on the drone, may project images on the screen. The patented drone with screen looks similar to “Weebo” from the movie flubber. Most cameras capture what we can see. But infrared cameras can detect and capture invisible infrared rays that we can experience as heat but can’t see. Heat is emitted by all objects above absolute zero and the amount of radiation emitted by an object increases with temperature. Thermal imaging allows one to see variations in temperature across a particular object or body. When viewed through a thermal imaging camera, warmer objects are generally distinguishable from cooler backgrounds. Infrared thermography operates in three wavelength bands: Medium Wavelength Infrared (MWIR), Long Wavelength Infrared (LWIR) and Very Long Wavelength Infrared (VLIR). LWIR cameras are the most commonly used IR cameras, as this spectrum is generally emitted by humans and other warm-blooded animals. LWIR imaging has many practical applications. The advantage is that LWIR is generally a passive tool because it is a measure of a signal emitted by an object, thus not requiring an additional light source. However, LWIR imaging has one big disadvantage – it lacks contrast with respect to background objects and noise. Therefore, images of people tend to look washed out and ghostlike, and it is difficult to obtain information from the images, which would allow reliable and repeatable identification of a person’s characterizing facial or other features. Now, the US Army has invented and patented LWIR imaging techniques to enhance identifiability of captured objects. The invented system models a three-dimensional topological surface of an object to provide high quality images. Initially, an image of the object is acquired, using a thermal imaging camera. The image includes multiple pixels each representative of at least one component of thermal data. Next, the system calculates a normal vector for each pixel in the image, corresponding to the normal vector on a surface of the object. Thereafter, a three-dimensional model representing a surface of the object is generated based on aggregating the normal vector for each pixel together in the image. Certain portions of the subject’s face are much easier to recognize in the improved image when compared to the conventional images, i.e., eye-brows, eye-lashes, teeth, wrinkles in the forehead, etc. Finally, the image can be mapped onto the three-dimensional surface representation to provide a better view of the object being captured by camera.